Tuesday was the last day of school for my 2E girls! I know they’re relieved. (and so am I) They work harder than anyone probably suspects in order to keep up with their peers in the Gifted program. I found something sort of heartbreaking in the pile of stuff Zoolander brought home from school today, especially knowing that her ‘Stealth Dyslexia‘ makes math calculation & spelling a challenge for her. It was a piece of paper (or some kind of royal proclamation?) from the first day of school last fall. Zoolander said their assignment was to write down what they were worried about as they started 3rd grade. This, from a 9-year old who scores very high on intelligence tests, but has already learned to be worried about her weaknesses. The worries of a 3rd grader. I called home to tell the girls I’d be late because I had haircut appointment after work. Lily was immediately not happy. When I made a joke about how much she must want to see me, she got mad and launched into some angry explanation about some sentences she had to write and she needed me to help her and now she was never going to get done! When I suggested that she start without me, she got even more upset. I mentioned to her that these seem like the ‘volcano’ feelings that Dr. K talks about. I hadn’t seen Lily this upset about writing in awhile. Up until this year, she would get angry and frustrated almost every time she had to write something. It was torture for everyone involved. She couldn’t even start writing a sentence by herself and often I scribed for her, helping prompt her along the way. Now I know that part of this writing difficulty is caused by her Executive Function deficits in planning and task initiation, which seem to be fairly common in people with ADHD or Dyslexia. Lily has trouble sequencing her thoughts and getting them down on paper. There’s a huge discrepancy between what goes in her brain and what comes out in written expression, which is, of course, frustrating for her. Although this article on written expression and Executive Function focuses on the bipolar child, there’s some great info in it for all students who struggle with writing. This year, in 6th grade, Lily has really improved in this area and usually she is able to work on writing assignments by herself. When I got home tonight though, she kept trying to put off working on her writing. Finally, when I asked a few more questions, she launched into another tirade about a test that she had to take at school and she had to write sentences for her answers and usually she doesn’t have to write the answers and she had to write sentences to support her answers and she got all the answers right but missed points because she didn’t know how/didn’t have time to write the support sentences. I asked if her frustration with that writing earlier in the day had anything to do with her frustration with writing tonight and she said she thought that it did. Next thing I know she’s in the office, in the dark, sitting focused at the computer, typing her science analysis answers in a wacky font. Probably took her 30 minutes total and then she was perfectly happy, at least until she realized she still had to write down her chapter notes for her Lit Circle. Then came a mini-rant on how difficult it is to write notes while she’s reading. I reminded her that the teacher said it can just be a few notes she jots on a Post-It after she reads. So, after giving me a long, detailed verbal description of her chapter in The Golden Fleece, she scribbled down a few notes, which she then typed on the computer using a giant Greek font and titled with Jason’s name translated into its Greek spelling. I think a lot of time, when faced with a writing assignment, she is just overwhelmed by a wave of emotion–frustration is what she’s used to–and then it usually it subsides quickly. Just have to keep working on making her aware and giving her the tools to use self-talk to quiet the volcano. So… writing. I know a lot of Twice Exceptional students struggle with writing, maybe, like Lily, for several different reasons. Now in middle school, Lily says she doesn’t turn in a lot of her work on time because she doesn’t have enough time to finish writing it in class. She does well on her tests & quizzes because, most of the time, they require short responses. But her in-class work is a struggle, even when using her netbook. It’s better, definitely, but still hard. This is actually the 2nd issue, besides organization, that I want to discuss at her IEP review mtg tomorrow… some sort of reduction of repetitive, written work. Lily has always had a hard time with writing. We first noticed in 2nd grade, when we discovered that she had a desk stuffed full of unfinished worksheets. Her teachers reported that when Lily was faced with a blank sheet of paper, she would shut down or melt down. Actually, I first thought something was up in 1st grade, when I made her hand write her classmates names on their Valentine’s cards. It. took. for. ever. And I remember getting frustrated that it was taking her so long. Oh, it kills me to think about it. 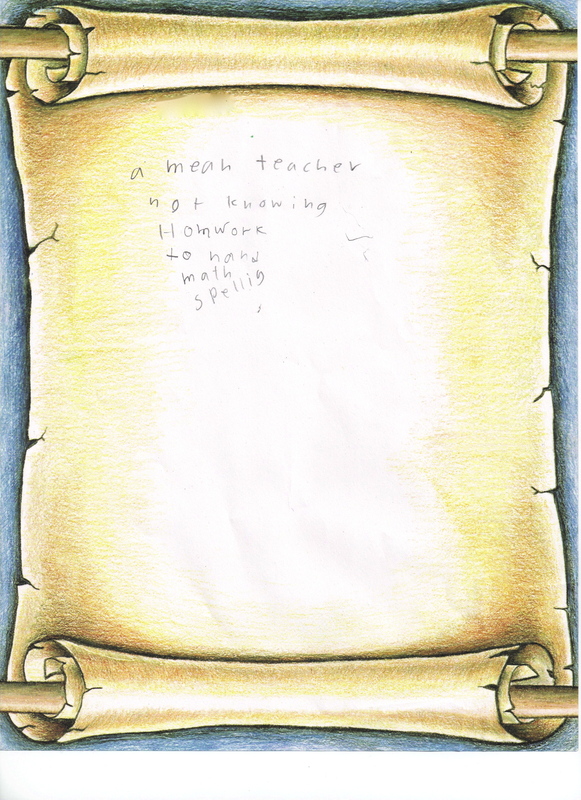 Even up through 5th grade, I scribed most of her homework assignments for her and she was unable to even start a writing assignment on her own. At the end of 5th, we got her up to speed on typing and she began using a laptop for most of her written work in class. That did make a big difference, but that was only one part of the problem. Lily’s writing difficulties are caused by a few issues… Dyslexia, Sensory Processing difficulties, and ADHD/Executive Function issues. DYSLEXIA-In her learning evaluation, Dr. Paula found that Lily had highly-compensated dyslexia. Lily was a late reader; didn’t really read until the end of 2nd grade, but by 5th she was reading a grade-level ahead. Dr. Paula felt that Lily was such a visual learner that she was using her visual memory to decode words and was using a ‘holistic sight method’ to spell. Her dyslexia was showing up in her difficulty with writing. This amazing article on Stealth Dyslexia, which describes both my daughters, was first written by Brock and Fernette Eide, back in 2005, but I feel that many educators still seem unaware that it exists. Dr. Paula did not think Dyslexia was Lily’s main issue with writing. SPD/Sensory Processing-Lily’s sensory issues were also interfering with her ability to write. She has decreased fine motor skills and she is left-handed, which makes writing a laborious process and still makes her handwriting very difficult to read. Switching Lily to typing has made writing somewhat easier for her. ADHD/Executive Function-This was and still is the big doozy. Lily’s executive function deficits interfere with her ability to plan and sequence her thoughts and then, get them down on paper. Visual organizers are supposed to help with that, but it did take some time for Lily to find one that was a good fit for her. She also performs much better if she is taught to plan her writing in a very structured and repetitive way… like a formula that just requires that she plug in her own words. In the beginning though, just one year ago, Lily’s EF was so bottlenecked that she even needed the steps to get ready to write spelled out for her… get a pencil out, get your writing notebook out, etc. Lily has made great strides this year in 6th grade and is writing much more independently than I thought she would at this stage. I feel like she’s able to plan, initiate and sequence her writing so much better, but it just takes her longer than her classmates and that’s something I want to discuss at our IEP meeting. Just one final thought on twice exceptional students and writing for now. I know several families and their 2E children who struggle with writing and we all have the same question… Where are all the research-based intervention programs for writing? If dyslexic students often have difficulties with writing too, why is it so hard to find them help? I have to decide what to do about piano lessons. It’s important to me that my girls learn to read music. I know it’s good for them. I come from a musical family and I know that they both have some natural musical talent. The problem is… piano lessons are a major stress for the whole family and I’m wondering if, especially with all we have going on with school this fall, we should take a break. First of all, they’re on Saturday, which my husband doesn’t like because he wants to be able to take the girls and do fun things on the weekend. But they have to be on Saturday because when he’s working, I can’t get home from work in time to take them on a school night. Another reason is that it’s difficult enough for me, coming home from work and getting homework, dinner and baths done before bed, but then I have to also force them to practice piano. Lily freaks out if she doesn’t feel like she’s ready for her lesson and gets worried that her teacher will be upset with her. Zoolander just hates piano lessons in general. She plays slowly and hesitates as she plays, which her teacher feels is a bad attitude, but I really don’t think so. I feel like whatever issue Zoolander is having at school is also affecting her ability to learn to read music and play piano. She has a very hard time learning the notes. We do flash cards over and over, but when you point to a note on the staff, it’s like she’s never seen it before. I’ve been googling Dysgraphia & Dyslexia to see if there’s any relation to difficulty reading music. After seeing how hard it was for Zoolander to copy those words and how she got lost on the page, I can see how reading music would be very confusing for her. The problem is, I don’t know how to help her, but I don’t want to give up on music. She has a beautiful singing voice, just like her aunt. Maybe a different method? Suzuki? I’m hoping the learning evaluation will help shed some light on my twice exceptional daughter #2, but in the meantime, I’ve got to discuss this with their piano teacher and decide what to do.